The World Burns: Are We Witnessing Geo-Engineered Laser Fire? – Coercion Code – "Dark Times are upon us"
The World Burns: Are We Witnessing Geo-Engineered Laser Fire? With Europe now facing one of its hottest days ever with a killer heatwave scorching local temperature records all across the continent while taking more lives and leading to people sleeping in supermarket refrigerator aisles, the death toll from the devastating wildfires in Greece rose to nearly 100 people and as we see within this ANP story, fires continue to spread across much of the Western half of the United States. 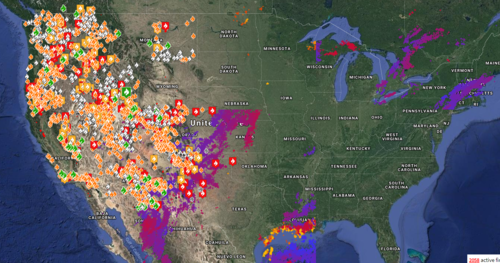 As you can see in the screenshot we’ve taken above from the website FireWeatherAvalanche, there are currently 2,032 active wildfires going on across America at this moment, nearly all of them in the Western half of the country. Though there are countless forms of human activity damaging the climate and biosphere, illegal global climate engineering / solar radiation management operations are a primary causal factor fueling catastrophic wildfires all over the globe (which official sources are not disclosing). Climate engineering is completely disrupting the hydrological cycle, triggering increasing dry lightning, destroying the ozone layer, contaminating soils, and covering everything at ground level with an incendiary dust (due to the fallout from atmosphere spraying programs). The 10 minute video below (ANP: the final video at the bottom of this story) elaborates on the direct effect geoengineering operations are having on forest fires, their behavior and their frequency. Geoengineering is nothing less than weather warfare. Other recent western infernos also confirm the impact of climate intervention operations. The satellite animation below was recorded on October 11th, 2017, it is important to examine carefully. Anomalous, counter-directional and extreme wind patterns over the core wildfire region was a major contributing factor in the firestorm cataclysm that occurred in the Santa Rosa region of California . All official sources continue to ignore and omit any discussion of the ongoing illegal climate engineering operations. According to an August 1st story over at Air Crap that Steve Quayle had linked to on his website on Wednesday, the explosive and rapidly spreading wildfires that have broken out in both California and Greece may have been caused by ‘directed energy weapons’. While the mainstream media would surely call such a claim a ‘conspiracy theory’, Pro News in Greece also published a story on August 1st in which they reported the Vice President of the EYDAP, George Maistralis, is taking seriously ‘conspiracy scenarios’ which suggest that Greece is under a HAARP directed energy attack. And while the Pro News story in general had a mainstream perspective about Maistralis’s claims and didn’t necessarily believe that man attempting to play God and alter the weather was even possible, they did bring up some very interesting points within their story that we’ve gone ahead and republished below. 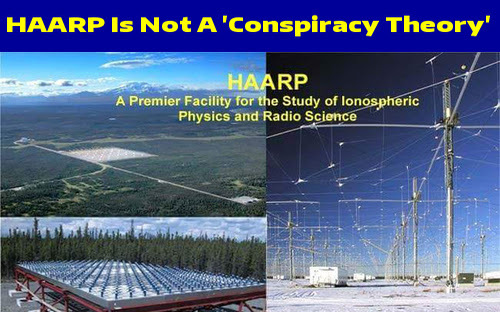 EYDAP vice-president George Maistralis says he is taking seriously conspiracy scenarios for a HAARP energy attack, as shown by his posts on facebook. He appears to be wondering if energy weapons are behind the extreme weather events that have caused floods and fires. We will say this: Changes in the weather are strange and problematic, but even if the weather can indeed be controlled by “other means” (something that the most powerful countries of the planet have been running special programs for decades to they do NOT justify the incredibly tragic mistakes and omissions of the state mechanism, on the basis of which until now 88 people have been horrified, property has been destroyed and thousands of others will be physically and mentally “marked” until the end of their lives . The HAARP experimental program aims at studying the ionosphere for its stimulation and use as an electromagnetic wave antenna, improving communications (eg HF, VHF, ELF submarine communications, etc.) but even for surveillance (surveillance). HAARP is funded by the US Air Force and Navy. It has special HF (2.8 – 10 MHz) high power (a few MW) power plants in Gakona, Alaska, which stimulates the charged particles of the ionosphere (eg, high energy electrons) causing VLF, ELF, etc. It is noted that ELF band frequencies (30-300 Hz) penetrate the ground and the sea mass revealing geological and oceanographic features of the planet at a very deep depth (tomography). 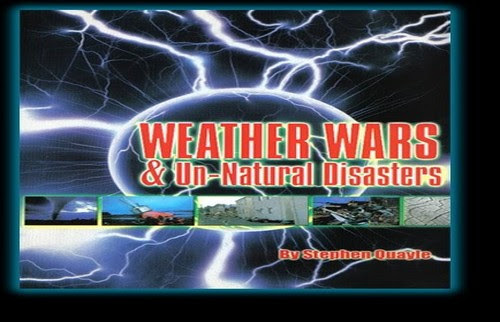 The program has been accompanied by conspiracy theories, according to which HAARP is an American “supergroup” of mass destruction, which through deliberate stimulation of the ionosphere achieves selective interruption of communications in specific geographic areas, neutralizing the inhabitants by putting them in a state of dormancy / inactivity (psychotronic weapon), causing weather, earthquakes (environmental / geophysical weapon), etc. Similarly to HAARP ionospheric systems, EISCAT (European Incoherent Scatter Scientific Association) with facilities in Norway’s Tromso (Norway, Sweden, Finland, Japan, France, Great Britain, Germany, China) as well as Russian SURA. A similar system exists in Akrotiri, Cyprus. And while the mainstream media will continue to call ‘weather modification’ programs,geo-engineering and weather warfare a ‘conspiracy theory’, so many people who get their news from non-mainstream sources who are well aware of weather modification programs may soon outnumber those think it impossible for man to change the weather. And if after reading all of that, you’re still a ‘weather modification denier’, we encourage you to visit Dane Wigington’s Geoengineering Watch website’s extensive list of nearly 100 years of weather modification patents which detail for us some of the secrets that the mainstream media is now keeping from the American people. Another great source to take a look at is this document directly from the US Air Force titled “Weather as a Force Multiplier: Owning the Weather in 2025“ within which they describe a ‘global weather network’, the military system for weather-modification operations and several chapters on altering the ionosphere. And while at this moment we have no absolute proof that the fires burning out West or the killer fires in Greece were intentionally caused by directed energy weapons, we see tons of evidence in the videos below that the technology exists to create and sustain such raging fires including this July 24th story over at The National Interest titled “Here Come The Lasers: The Dawn Of Energy Weapons Is Here“. In the first video below from A Plane Truth our videographer takes a look at what he calls ‘GeoEngineered Genocide by Laser Fire’ and what he believes have been directed energy weapon attacks upon Shasta County, California while in the 2nd video below from videographer Jim Lee, he takes a look at the history of weather modification programs while looking at more evidence that directed energy weapons are being used.